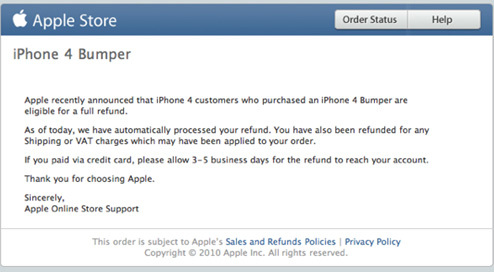 No, it’s not the iPhone 4 price amount that Apple is refunding but all those users who bought iPhone 4 bumper cases are receiving automatic refunds via online Apple store. It must feel nice to actually receive money from Apple for the first time instead of transferring it to their account to buy a new gadget. 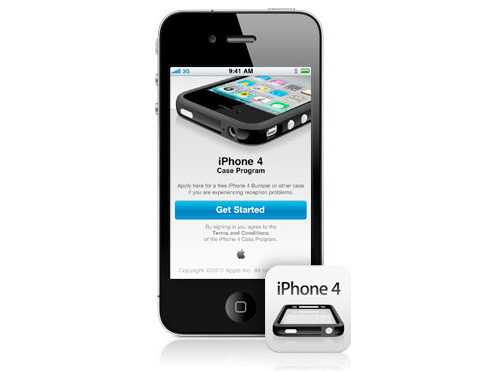 Apple CEO Steve Jobs promised at the Apple press conference last week that anyone who buys a new iPhone 4 till September 30th will get a free case and those without one are entitled to get one from their retailer or via applying online. Those who had already bought one were assured of a refund. The refund started this morning with Apple hitting users’ credit cards, returning the amount including all taxes and shipping charges. If you’re an iPhone 4 holder from a country Apple ships to and who didn’t buy a case, download the iPhone 4 Case Program app from the app store. Next, sign in to your iTunes Store account, select your favourite bumper or case and start waiting patiently for it to arrive.